Expired postcard US-2293198 to Ukraine, sent on June 28, 2013, was about to enter the postcard graveyard after 365 days. 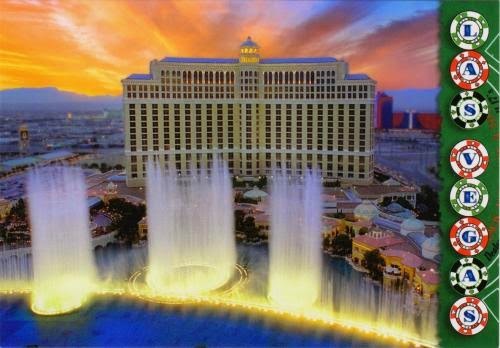 It features a fantastic sunset view of the famous music water fountain at the Bellagio Hotel and Casino, with a column of gaming-chip styled tokens to spell out "Las Vegas." At the 2014 FIFA World Cup yesterday, USA lost to Germany 0:1. However, helped by the result of the match between Portugal and Ghana, Team USA still advanced to the next round. It sounds like a typical Las Vegas story: you try hard, but may still lose; yet with a little luck, you may still come out ahead.